Ahead long - awaited event- your wedding. One of the most important elements in the preparation for the celebration invitations are for your friends and loved ones. These beautifully designed postcards to notify dear to your heart people about how important and exciting decision you have made. The main thing - to fill them with sincerity and soul. 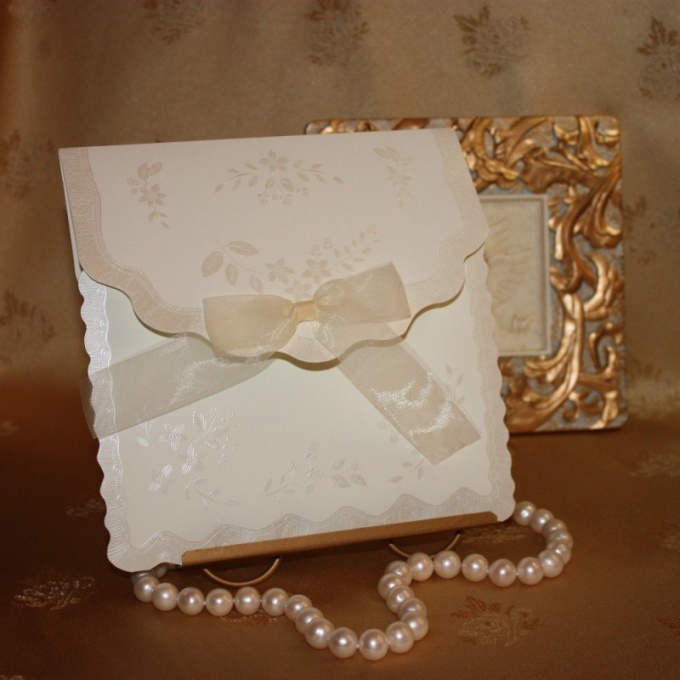 Determine what you would like to see invitation cards for your wedding. You can make them yourself out of beautiful paper and decorative elements to design on the computer in a graphics editor and print out or buy ready-made. However, it is better if the text in the invitation is written by hand, as it gives a special atmosphere of trust and shows your reverent attitude to the future guest. Any invitation card begins with treatment. Not necessarily all are invited to use the same epithet. Treatment can be absolutely anything, depending on your relationship with the person. The only thing worth to consider is the formality of some of the cases. For example, should not be too emotional to paint the card you plan to give your Director. If you bought a ready-made invitation cards, you only have to enter the time and place of your celebration, the rest of the text you come up with the design. However, if you completely fill the card, try to make sure she wasn't overloaded with information. Usually after the treatment is written the main text what kind of event you invite the person. Now write where and when will the celebration. Please specify where and how much it will be a solemn registration of your marriage after the address of the restaurant, which will host the main celebration. If you would like to invite a guest to the gala Banquet, the card is to specify only the start time of the event and the address. Be sure to sign up under invitation. Typically, the signature includes just the names of the newlyweds. Can add to the postcard romantic or funny poems about weddings, jokes, or even jokes. This will make your invitation original and different from the others. You can think of a caricature of ourselves and draw it in each card. Some newlyweds are making to the invitations list of desired gifts. If you adhere to the view that it helps the guests in preparation for the holiday can also write your list, or just write what you would like to receive a gift of money. Can also provide their contact numbers so that the guest could warn if can't come to your party.